Summer has been hot in Kansas City! It's been a steamy 95 to 100 degrees almost every day this week! Whooo! It's so hard to be stylish and comfortable in these insane temps! To stay cool I've been wearing some of my favorite summer dresses with simple jewelry styling. I love a bold dress that makes a fun statement without having to add too much to it. 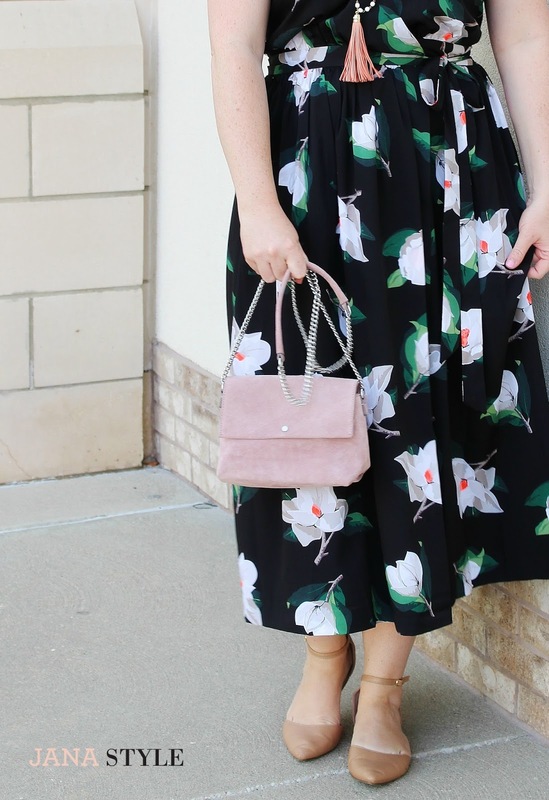 This Banana Republic floral midi dress is light weight, easy-breezy, and I love the flowy skirt and sassy slit! I always gravitate towards a dress with a vintage flare and this one has a bit of a fifties glam girl vibe! It seems like as soon as summer hits I live in dresses like this one. I love the girly feeling of a full skirt and heels. · * Versatility – I love a dress that can be worn for several things, weddings, lunch with girlfriends, to the pool, etc. If I can wear a dress for several different events or occasions and style it up several ways; that makes it a keeper for me! 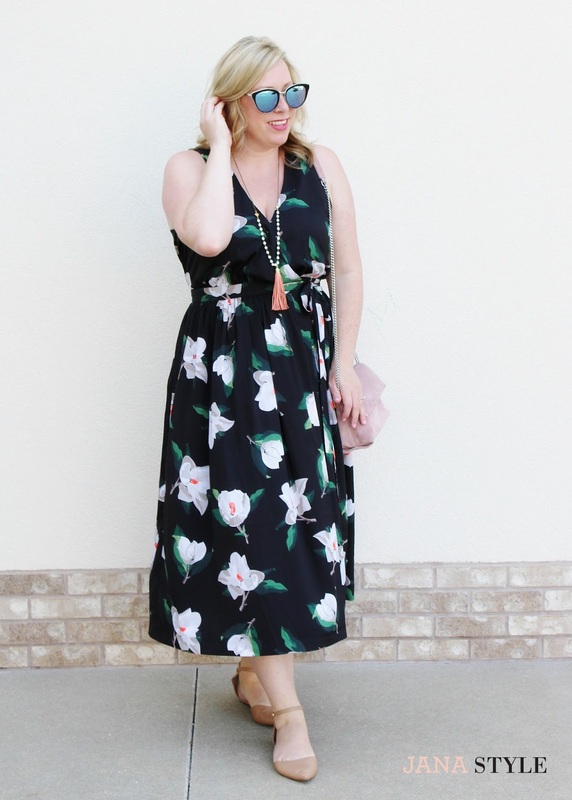 · *Fit & Style – I have a few favorite dress fits that make me feel my best. Empire waist, wrap dresses, and a dress with a thicker straps or sleeves tend to fit my body shape best. 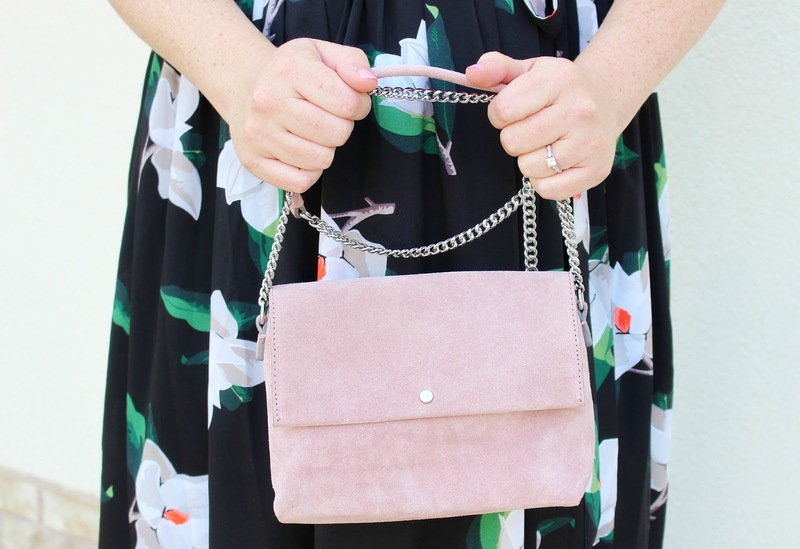 Finding what styles fit me and make me feel comfortable is the first step in knowing where to start when shopping. · * Color & Print – I am a girl who loves to play with color and print. Although it’s easy for me to gravitate towards black and white, summer is the perfect time to add some new colors or patterns into my wardrobe. I always try to keep that in mind when shopping. This pretty floral print stood out to me when I was shopping online and I loved that it still has a sophisticated look. Those sunnies! Of course, the whole outfit is fab, but I LOVE the sunglasses! that dress is so pretty! That is definitely the perfect summer dress! Need one of those for the florida heat! Such a fantastic print!!! I love love love this dress! You look fab babe. What a gorgeous dress! I love the slit too! I wanted this dress so bad but it didn't fit me as cute as it does on you!